The multi-award-winning Scottish Chamber Orchestra gives its internationally-acclaimed principal musicians a chance to dazzle in Weber's virtuosic and thrilling concertos. 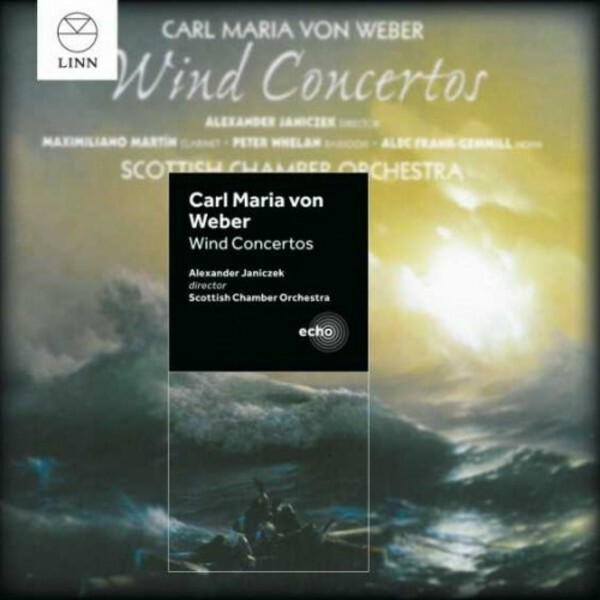 Originally released in 2012, 'Weber: Wind Concertos' has been re-issued as part of Linn�s ECHO series which offers a second chance to enjoy the best of the label�s award-winning catalogue. Alexander Janiczek leads Maximilano Mart�n (clarinet), Peter Whelan (bassoon) and Alec Frank-Gemmill (horn) in a thrilling programme. Composed at a pivotal time in the instrument's development, the Clarinet Concerto is one of the cornerstones of the clarinet repertoire, performed impressively here by Maximilano Mart�n. The Spanish clarinettist is rapidly establishing himself as one of the most exciting and charismatic musicians of his generation. For this performance, Peter Whelan has reconstructed a version of the 1822 Bassoon Concerto score rather than employing the commonly used 1865 version. Peter Whelan is one of Europe�s leading exponents of historical and modern bassoon and the founder and artistic director of Ensemble Marsyas. In a unique twist, Alec Frank-Gemmill performs his own version of the cadenza in the virtuosic Horn Concertino, famous for its chromatic pitches and the requirement of multiphonic chords. Recognised internationally for the beauty of his tone, Alec Frank-Gemmill ranks among the finest of a new generation of horn players. The Scottish Chamber Orchestra is a world-renowned orchestra whose recordings with conductors such as Robin Ticciati and Sir Charles Mackerras have resulted in multiple accolades and awards.